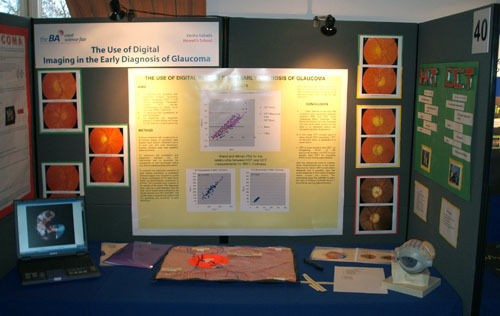 These project displays were used by Nuffield Research Placement students at the BA CREST Science Fair which was held at the Royal Society in February 2007. Poster dispay by Varsha Kadaba from Howell's School Wales whose project was titled 'The Use of Digital Imaging in the Early Diagnosis of Glaucoma'. Display used by Hannah Brandon from West Kirby Grammar School. Her project was titled 'Characterization of Salmonella Typhimurium strains from UK Greenfinches'. Poster display used by Holly Batchelor, whose project was titled 'Cosmic Rain: investigating particles from Space'. Display used by Sarah Wilkinson from Altrincham Grammar School for Girls. Her project was titled 'Motorised Wheelchair with a laser guidance system for doorways'. Poster display by Shiraz Ziya from Birkenhead School whose project was titled 'Fresher laundry makes scents: the changing composition of a perfume'.